News Corp is unloading more of its digital assets. 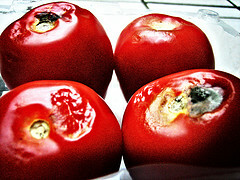 This time it’s the movie review site Rotten Tomatoes, which is being acquired by startup Flixster, which has the most popular movie app for the iPhone and other mobile devices. The purchase price was not disclosed, but it was at least in part a stock transaction. News Corp now owns a minority stake in Flixster, which has only raised a total of $7 million in venture capital. Flixster already shows Rotten Tomato reviews and ratings within its iPhone app (you can contrast the critics’ reviews from Rotten tomatoes with Flixter user reviews). Putting the two companies together certainly strengthens Flixter. The combined reach of both is 30 million unique visitors a month across all different platforms, according to the companies. 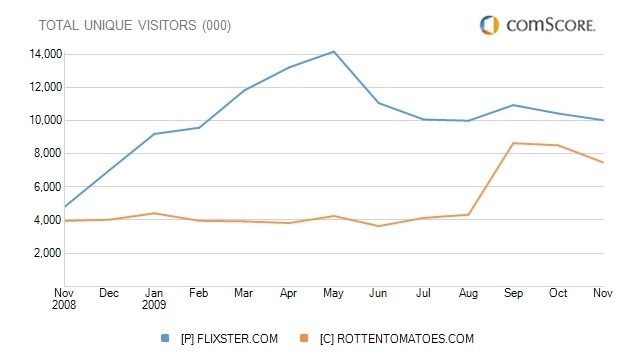 Just looking at their websites, Flixster has 10 million monthly global unique visitors versus 7.5 million for Rotten Tomatoes (see chart below). In October, News Corp sold off Photobucket to Ontela for $60 million. Expect it to divest more of its digital businesses this year.